What Happens To The Fingers? Talk about a sport taking a physical toll! We’re quite used to baseball players having shoulder problems. Bad knees in soccer players are no big headline. 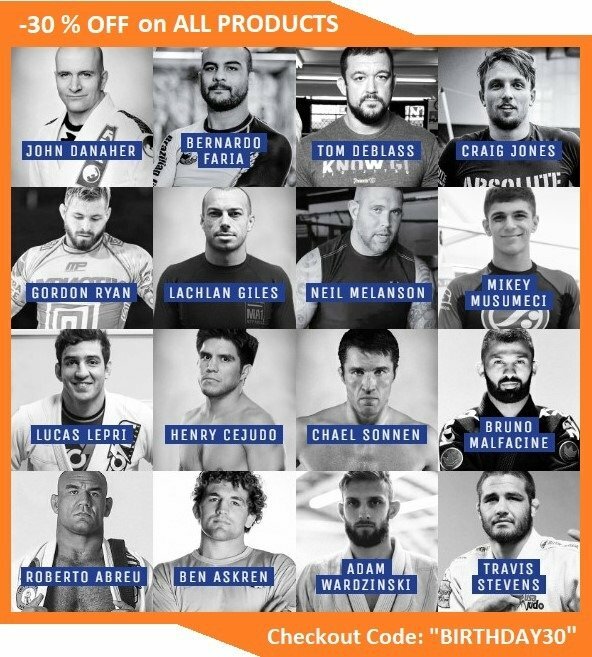 But what is an injury most specific to BJJ? Let me make this a little bit clearer. What is an injury most specific to Gi BJJ? Yeah, the whole body gets a beating and you might be hard-pressed to find an answer if you’ve been grappling longer than 3 years. However, the moment you try and type back an answer you’ll get on – the fingers. Gi player’s fingers are so destroyed they literally have to be held together by BJJ finger tape. 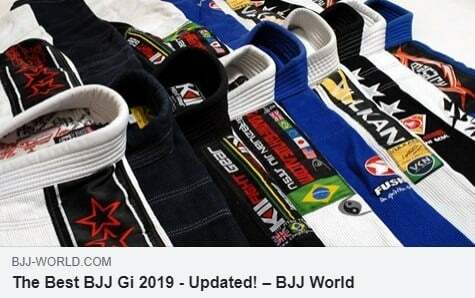 As every Gi player (and Judoka, for that matter) can testify, grappling after a few years is impossible without the heavy use of BJJ finger tape. Whether it is used on a certain finger, joints, a few fingers or all of them you’ll see it everywhere. It is so prevalent that people sometimes mistake it for a fashion statement. However, arthritis is a real problem in BJJ and tape sure provides a way to deal with it. At least in the short term. 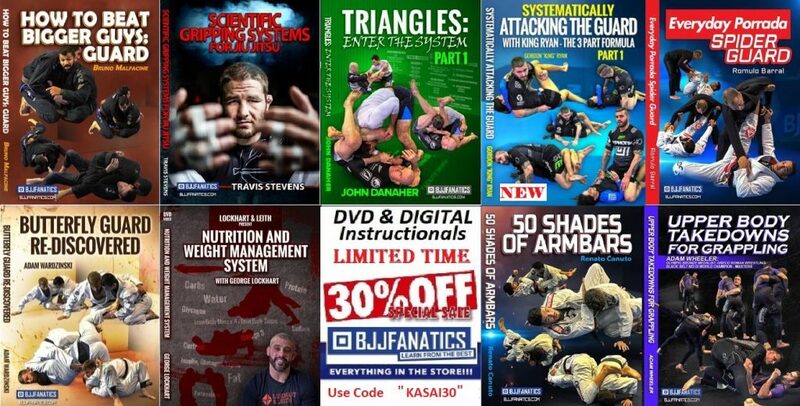 People that train exclusively (or just often) in the Gi, base their game around gripping the material very much. Sleeve grips, pant grips, lapel grips, belt grips, you name it. Every part of the Gi is fair game and people use it to the maximum to get an advantage. Gi manufacturers even try to make sturdier Gis make gripping them harder. This results in peoples’ fingers cracking and snapping all over. Before long, you’re taping your fingers together just to be able to train. The repeated trauma of constant pressure on the joint, as well as frequent minor dislocations, is a great recipe for arthritis. The joints primarily swell up, with inflammation being the body’s preferred answer to the inflicted trauma. Inflammation is caused by the constant tugging and pulling that puts enormous strain on the finger joints. This constant inflammation and trauma result in the reduction of cartilage in the joints, which is the definition of arthritis. Arthritis, or osteoarthritis, is a degenerative joint disease, in the case of BJJ caused by constant wear-and-tear. 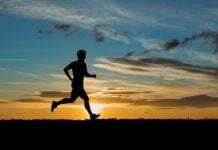 The condition may include the formation of bone spurs, bony enlargements and profuse ligament and tendon damage. The end result – pain. And by pain, I mean constant pain that’s greatly exacerbated by gripping again and again. This is where BJJ finger tape comes in. This tape is a bit on the thicker side, but as you’ll see later on, this might be just what you’re looking for. It is 3/4” wide and very strong, thanks to the thickness. A great aspect of this tape is that it stretches quite a bit. This is mostly due to the material. 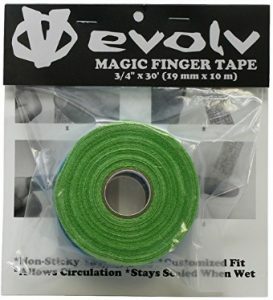 The Magic Finger tape is an innovative combination of Latex and Rubber, offering unique properties. The tape has an impressively tight seal, even in very sweaty conditions. It’s simple in terms of design and colors, but the top class in terms of providing the service it is intended for. Available in bright green. This is one of the thickest tapes available, standing at 1 and 1/2” wide. Very useful for wrapping larger areas, such as toes, or for the buddy-system. 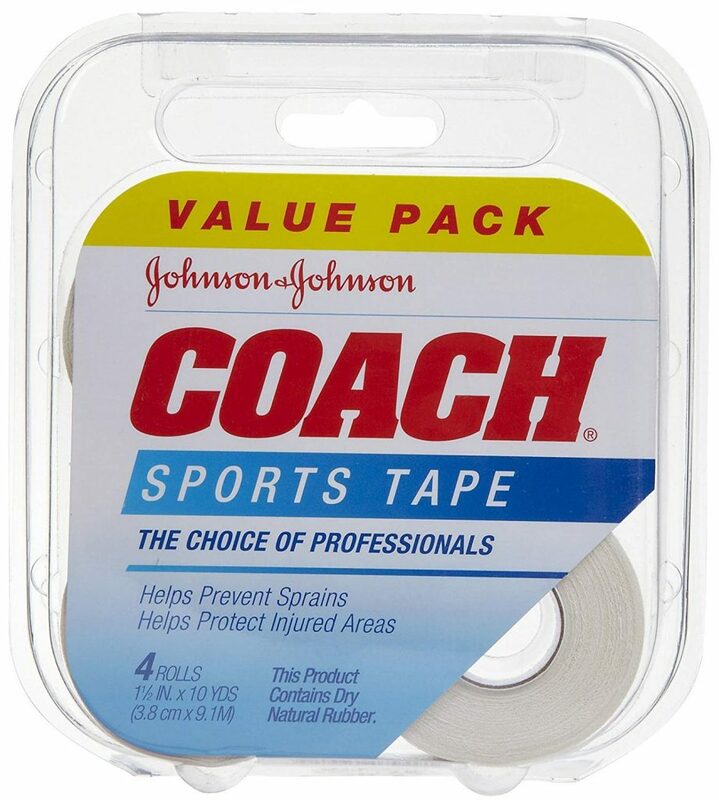 A great caveat of this tape is its price – it is the cheapest on this list. It holds really well and also provides an additional gripping surface. On a slightly negative note, it’s is short and does not last long when used constantly. However, this is often solved by the length of the tape which comes at a staggering 40 yards. The material of the Johnson And Johnson BJJ finger tape is rubber, making it perfect for grapplers. It is going to keep your joints stable while also providing enough flexibility for efficient gripping. The fabric is breathable and does not retain moisture. Comes in a white color and is made in the US. 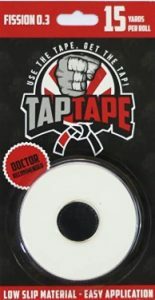 One pack of the tape contains four BJJ finger tape rolls. A 15-yard roll with a 0.3-inch width is always a good starting point in the search for the optimal BJJ finger tape. It has a high thread count and will last for a long time. It’s not too thick, which makes it great for wrapping the joints of the smaller fingers. It performs admirably under the harsh conditions of sparring, holding impressively. 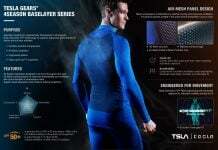 It’s made of “low slipping” material which gives it it’s tight holding properties. The secret behind TapTape’s success is the high thread count of the tape. This makes it next to impossible to tear it once you put it in place. It also means unraveling is not an option. It is very easy to apply and even easier to remove, which is often not the case with sturdy finger tapes. This is as minimalist BJJ finger tape as they get. Personally, I find this to be a huge benefit. It comes in very simple packaging and only in the color black. 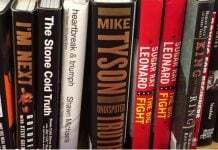 No wonder it is one of the favorites of grapplers worldwide. It’s a non-elastic tape providing maximum compression and great tension. It’s sturdier than the others on this list making it the best choice for immobilization of joints. It provides great value for the price since it comes with two rolls of tape in the package. The material is 100% cotton, which is great for those with sensitivity to Latex. The adhesive is extra strong and also has water-resistant properties. 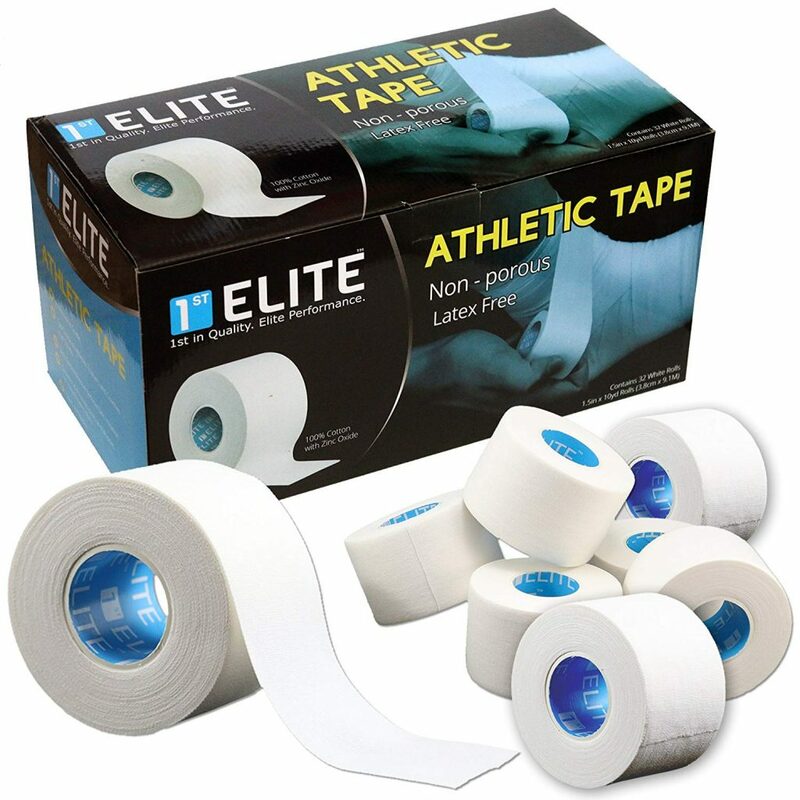 The tape also provides enhanced breathability, even when completely covered in sweat. It has very little elasticity as it is meant to provide massive support of the joints instead. Maximum compression is guaranteed. 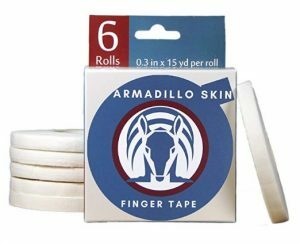 The “Armadillo Skin” BJJ Finger Tape is an ultra-strong tape for grappling, made entirely of cotton. The tape has dimensions of 0.3 in x 15 yds per roll, with a total of 6 rolls included in one pack. This tape has one of the best prices for such a “bulk” buy. The Armadillo has the incredible property of being easy to tear with your fingers as you’re setting it up, but able to stay snug when you tape it around your finger joints. The adhesive is very high-grade, allowing maximal support while not leaving any residue after you take it off. Completely latex free, available in white. 1st Elite is a brand that has athletes covered in all possible areas. In terms of finger tape, they offer a very high-quality product. Once again, it is a 100% cotton product, entirely Latex free. The adhesive is made of Zinc Oxide, making it extremely friendly to your skin. Even people with sensitive skin and certain skin conditions can freely use this tape without any adverse effects. The non-porous tape is remarkable when it comes to staying put. The adhesive is very strong, yet is easily removable once you’re done. The dimensions are 1.5′ x 10-yard rolls, and one pack has an amazing 32 rolls! A bit wider than most, but it does give you the option to cut according to needs, or tapes up larger body parts, like feet, ankles, and wrists. The tape comes with guaranteed satisfaction. This includes a 100% money back or replacement warranty. 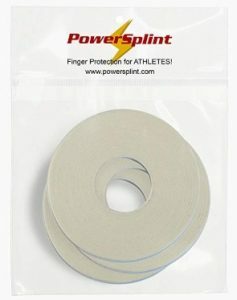 With the Power splint tape, you get a pack of three tapes, each 1/3 inch wide. This one is perfect for grapplers because it is thin and incredibly strong. 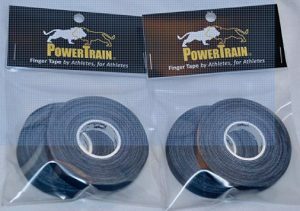 PLus, one roll is 44 yards long, make Power Splint the longest BJJ finger tape available! It is really easy to tear and put on, as well as discarding after use. Still, it is one of the tightest fitting finger tapes ever, and no amount of Gi rolling or competing is ever going to affect it. 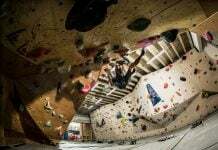 Full range of motion is guaranteed. 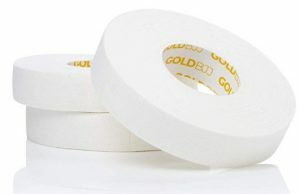 The Gold BJJ Finger tape is a strong grappling tape sized 1/2″ x 30′. 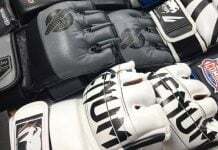 It is perfect for finger protection in any kind of grappling martial art. The tape is available in three different packs, each containing a different number of rolls. Namely, you can get 3,6 or 12 rolls per package. The tape’s adhesive is strong and intended to stay put specifically during grappling. Each roll is 10 yards long, meaning that you can get a lot of tapes, depending on the package option you choose. Original technology means that the tape won’t budge under any circumstances, including moisture. The thickness of this tape is also a great caveat as it allows you to tape different joints, as opposed to only your fingers. perfect for taping toes. 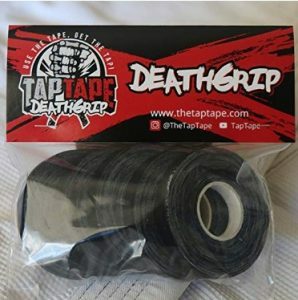 The final member of our list of the Best BJJ Finger tape is the Deathgrip Grappling tape made by TapTape. This one is specifically designed for Brazilian Jiu-Jitsu. Dimensions are 3.9 x 3.9 inches and there are 5 rolls per package. The package and the tape are ultra simple, working exceptionally well rather than looking good. The Tape comes in black color. Once again, it is sweat resistant, extra strong adhesive that’s sensitive skin friendly. Completely Latex-free (100% cotton) with a very high thread count. The tape is made in the US. Now that tape selection is out of the way, let’s look at the methods that’ll keep your fingers from falling apart. We already covered using the best tape available in order to avoid bad support or unwinding of the wraps. The next rule of thumb is to use a lot. Do not be afraid to commit to taping your fingers tight. In those terms, layers are more important than single strips. The reason is simple. Bjj finger tape seals better against itself than the skin of the fingers. And lastly, do not overtighten the tape. If you restrict circulation you’ll only make things worse, so provide support without cutting blood flow off. For me, X- taping is the method of choice. It provides me with great support while allowing the fingers as much mobility as possible. It is very durable and much tighter than single joint taping. The X pattern allows the wrapping to support itself along with the fingers. The X-taping pattern requires long pieces of tape, which is what must be considered when choosing a tape. The wrap starts on the side of a knuckle and after a couple of circles around it goes on to the other side crossing over the palm side of the joint. After a few more circles it goes back forming the X. Buddy taping is the best method to support really bad finger joints. It can be used with both single joint control, or X-taping as the base. In simple terms, the buddy system means you tape two of your fingers to one another. This provides extra support, much like a sling does for a broken bone. This method is great to tightly immobilize fingers. It’s intended to allow injured fingers to heal, rather than provide both support and mobility for chronically hurt ones. The problem with immobilizing only one finger or toe is that it makes it easier to get caught in a Gi. The best advice is to stay off the mats until the pain subsides and then use x-taping and/or the buddy system. If you’re intent on training with a fresh injury, though, your best bet is to use restrictive taping and enforce it with the buddy system.